Styled out for the 42nd year, the Patron Experience is by far the most luxurious way to attend the Telluride Jazz Festival. Featuring a private opening concert with Sammy Miller and the Congregation at the Sheridan Opera House, an on-stage seated viewing area, catered meals with the artists backstage and much more, Patron pass-holders will be treated to a weekend of world-class music, decadent food and drinks all surrounded by the unparalleled views of Telluride Town Park. Putting an emphasis on high quality, locally-sourced and fresh ingredients, this year's Patron Experience features an eclectic food menu served in a cozy, covered Patron Lounge located backstage at the festival. 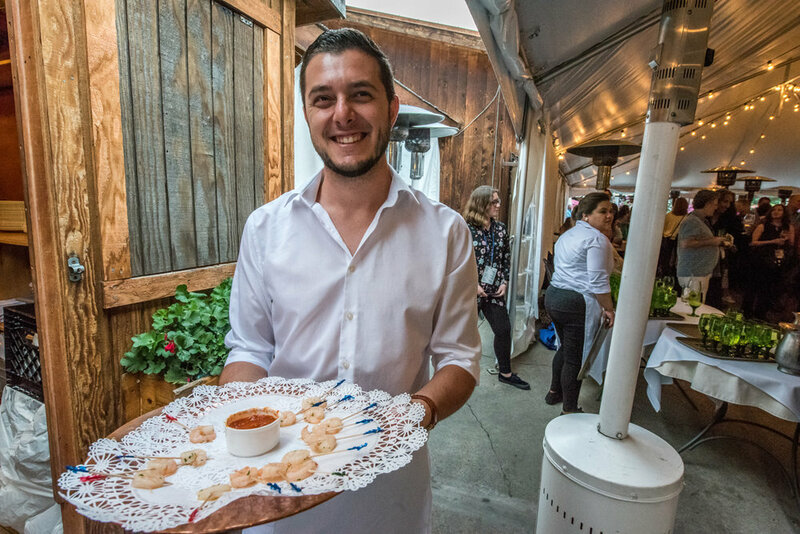 If you have dined in Telluride over the past decade, you will know that one of the leading forces of culinary excellence is spearheaded by New Orleans native Josh Klein. After rising to the top of the guard in numerous New Orleans Institutions he found his way to Telluride in 2005. Now the proud owner of the ever-so-popular Mama P's Po-Boys (a mobile vending operation), Bouilli Catering Company, Smugglers Brewpub and Side Work Speakeasy, he has made a serious mark on the local dining scene. If asked, Josh would most likely say his home state in Louisiana carries only a glimpse of his repertoire of flavors. He stays true to Southwest Colorado and brings inspiration from all of the homelands of his French, Spanish and Italian ancestors. Start your weekend off with a Welcome Reception on Thursday, August 2nd where the chefs of Rustico Ristorante have designed a menu of specialty dishes from every corner of Italy. Dine on some of Italy's most treasured dishes alongside members of board of the Telluride Society for Jazz and enjoy live music from the Telluride Student All-stars Jazz Ensemble on a rustic covered patio in the heart of historic downtown Telluride. During the weekend, pass-holders can enjoy backstage dining alongside the festival artists. Meals will be prepared fresh on-site each day by chef Josh Klein. On-Stage Viewing with Hosted Bar - Watch your favorite performance from the side of the Main Stage. Covered on-stage seating offers the most intimate festival experience possible. Experience a clear view of performers and the beautiful Town Park backdrop with an open bar featuring craft beer, wine and specialty cocktails within arms reach. To view the craft cocktail menu, click here. Already have tickets and interested in upgrading? Contact us to find out how you can take your GA or VIP Experience to the next level, click here.